There was a blind boy who hated himself just because he was blind, he hated everyone, except his loving girlfriend, she was always there for him, he said that if he could only see the world, he would marry his girlfriend.. .
One day, someone donated a pair of eyes to him and then he could see everything, including his girlfriend. The boy was shocked when he saw that his girlfriend was blind too, and refused to marry her. What make our lives complete is such self-forgetful love and compassion and a feeling that you are 'someone special' ...to....someone special! ...do I have to say I felt special (Yah! for a chutney.. hehehe!) and it tasted yummilicious! 1. Heat oil in a wok, add in urad dal, cumin seeds, red chillies and hing. When they start to crackle add garlic and onions. Saute for 2-3 minutes until soft and tender. 2. Now add chunks of tomatoes, green chillies with fresh coriander and cook for 7-8 minutes on medium-low. When they are mushy and pulpy, add shredded coconut and mix well. 3. Season with salt and turmeric. Turn off the heat and grind the contents until smooth, to chutney like consistency, adding water if needed. Being an ardent lover of fresh fruits and vegetables, I am sending this colorful chutney to Abby's 'Vegetables, Beautiful vegetables 2008' event, celebrating the national vegetarian week (19th to 25th May) in UK. notyet100 gave me 'You make my day' award. Thanks dear. Each of my blog readers 'make my day' by their lovely and supportive comments. Thanks to one and all and I pass on this award to a dear friend of mine, who with her contagious smile truly make my day......complete and worthy! Swati and Ranji, my co-marathon runners thought I was a Rocking!... Thanks dearies and I seriously lost count who received what. So, I dedicate this to all of my fellow bloggers who painstakingly cook, patiently take some drool worthy pictures and blog about them !.. :D Happy Food Blogging folks! Recipe Marathon Menu: Day 6 .. still going strong.. yeh yeh! Arundathi made some utterly delicious Raspberry and Blueberry Muffins.. The Mela Queen whipped up Onion chapathis today! 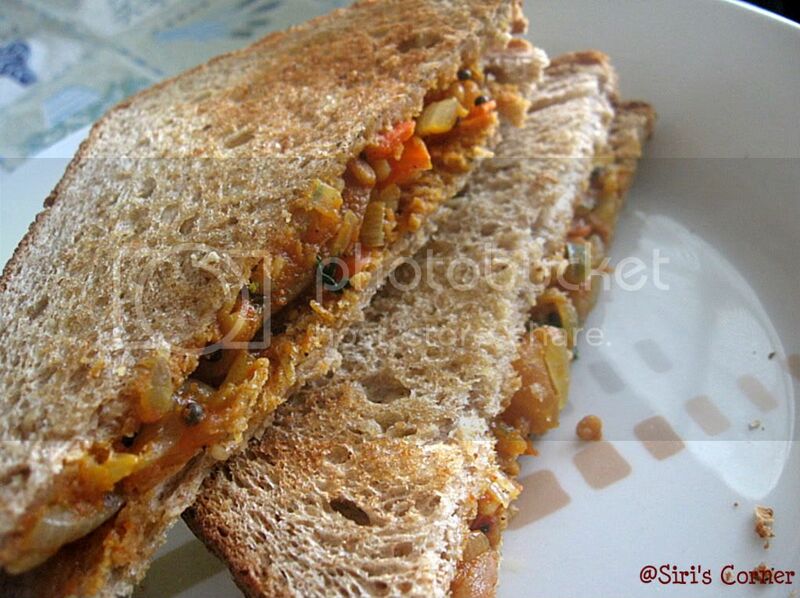 Lakshmi blogs about how good Kashayam is..
Raaga made yummy looking Vegetable Focaccia. Divya is up with Cauliflower-Peas Poriyal. 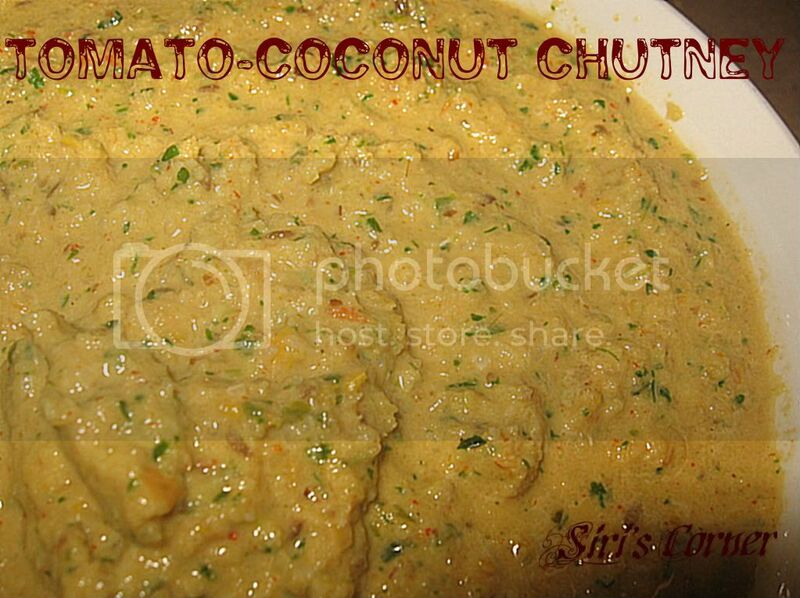 Want some Mint Coriander Chutney - Hop on to Swati's blog then! Bhags made Baked Chapathi today! Dhivs made some crunchy munchy Vegetable Chips! Chao for now and Have a great Thursday! Thanks for the wonderful story, Siri! So touching! That's so nice of your hubby to make this chutney for you! And it really looks yummy! And Congrats for the awards. the sandwich looks delish. Wonderful story, wonderful chutney. I have not tried this combo before, tomato and coconut. I will try it out very soon. Thank you for your wonderful comments in my blog Siri. You truly make me feel very special. Recently only I saw your comments in Telugu. My mother tongue is also telugu only, but being raised in Tamil Nadu it's not as good as Andhra people. Tomato chutney is mouth watering! I am yet to make it and post it on my blog. Thanks for your comments on my blog. Thats a very touching story,made me sentimental.....and the chutney looks yummy,will definately try it..
Story goes well with ur hus chutney! Lucky girl, you are... Good one to try, the sand looks great! girl..do make it clear to everybody that you are in the good old days of spinsterhood..hehehe...or have you got married without even telling me...:P..
lovley, lovely chutney siri - thanks for sending it over to vegetables, beautiful vegetables! and good luck with the rest of the marathon! Tried the chutney for today's dinner as side dish for dosa. It was so tasty. Especially my husband LOVED it. This is going to be a regular henceforth. Thanks so much for the recipe dear.